The ProToast is here. 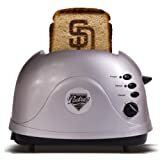 New from Pangea Brands, this great retro style toaster not only has your favorite team on the outside, on the inside it is toasting your bread with your team?s logo too. 2 slice toaster with adjustable settings for desired toasting levels, including a setting for frozen breads too. This will work on white and wheat bread, as well as frozen waffles and English muffins. Made in China, final assembly in USA. UL tested and approved. This entry was posted on May 20, 2011 at 4:38 pm and is filed under San Diego Padres. You can follow any responses to this entry through the RSS 2.0 feed.